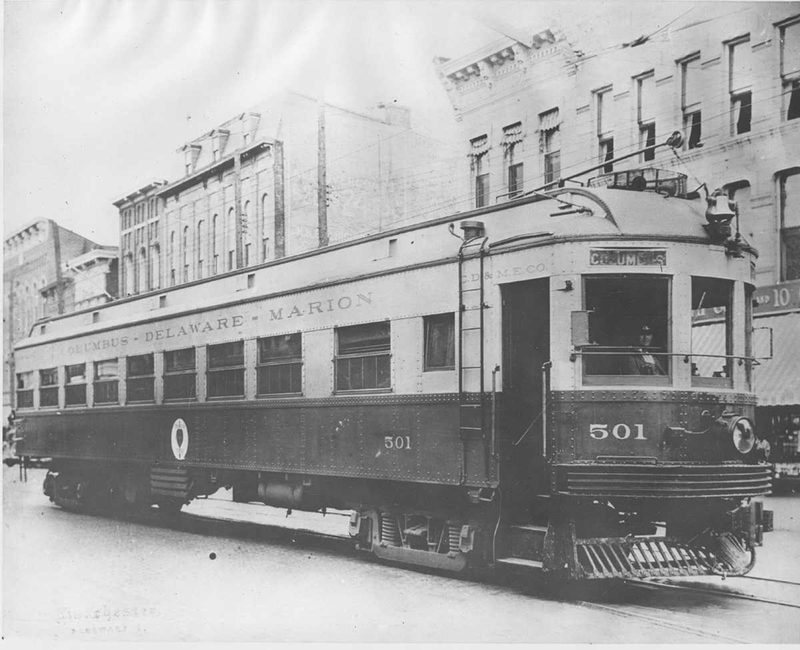 CD&M parlor car #501, the "Red Bird", stopped for passengers in Delaware, Ohio on its way to Columbus. Clyde Ruder is the motorman. From the Dave Bunge Collection. 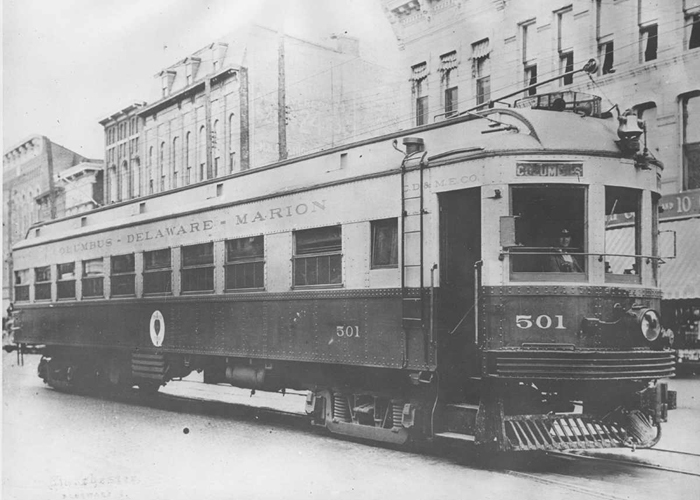 Columbus, Delaware & Marion Railway Co.
Columbus, Delaware & Marion Electric Co. Working at the Ohio Railway Museum in the 1950's you couldn't help but be steeped in the lore of the CD&M. For starters our ORM secretary was Virgil Eberly. Virgil, a civil engineer, was in his seventies in the 1950's. In the 1920's he worked on the construction of the CD&M's 6.5 mile Worthington cutoff. Thirty years later he was back surveying the cutoff all over again, this time to locate the tracks for the ORM which was built on part of the old CD&M cutoff. Then there was Bob Zimmer whose father was a motorman on the CD&M until a tragic accident caused him to give up the motorman's job. He, like railroaders everywhere, knew the dangers of railroading, yet he couldn't get over the loss of life no matter who's fault it might have been. Bob taught us, through his stories, that Clyde Ruder was the premier motorman and much respected by his fellow trainmen. That Kingman hill south of Stratford was always a problem for their freight trains as was the Arcadia Avenue grade on Columbus' north side. He told us about the spidery trestle over Glenmary ravine. Some motorman crept over the trestle, others never slowed down. And then there was George Silcott who remembered seeing the "Red Bird" flying past his dad's Worthington coal office when he was very young. When he was six or seven he rode his bicycle the mile to his dad's coal yard office so he could watch the interurban go by and got into big trouble with his dad. Something he never forgot. Through the museum he helped recreate that long ago image. All-in-all the CD&M was our special interurban line.